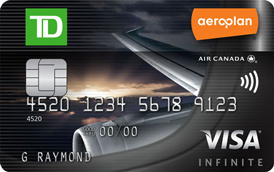 Welcome to a new monthly feature here on the Rewards Canada blog, the Top 5 Credit Card Sign Up offers. Now, this is not a 'best' credit card list like our Top Travel Rewards Credit Card rankings but instead a look at cards that have very good acquisition offers. As always when choosing a card you should always take other factors into account other than the sign up bonus, but when most of these cards are first year free, they can and do pay off even when not taking into account insurance packages and other non-reward benefits. In fact 4 of 5 cards on this list for February are first year free so you can try them out at no cost and decide later on if the card is right for you. All the while earning the sign up bonus which can be used to subsidize your travels! The only card that isn't first year free is the Starwood Preferred Guest Credit Card from American Express. It has an annual of $120 but the new sign up bonus of 20,000 Starpoints is worth no less than $400 depending on what you value Starpoints at. A very strong card in the earn category for Gas, Grocery and Dining/Entertainment purchases, the current sign up bonus for the Scotiabank Gold American Express Card is 20,000 points when you reach $1,000 in spending in the first three months. That 20,000 points is equal to a $200 travel credit and since this card is a book anywhere card you can book the travel how you want when you want and when the charge shows up on your account you can redeem the points against the charge. The card normally has a $99 annual fee but of course that is waived in the first year! Other than the Starwood card, you ultimately could end up with at least $1,000 in travel credits with these cards but even if you only take on one or two you are helping your travel budget significantly at no cost other than regular credit card spend. This is a great list! If you've had these cards before, do you know if you can re-apply and still receive the sign up bonus? Specifically, I'm looking at the AMEX Gold Rewards. The Amex GRC should be available to you after 6 months from the day you cancelled it. Luckily here in Canada, Amex hasn't followed the U.S. in that you cannot receive the bonus again ever! Great thanks. Yes, I read about AMEX in the US, but I couldn't find that information for AMEX in Canada. I noticed that your Credit Card Rankings show the Capital One Travel Aspire as no longer available. I'm confused as it shows available, have they changed it or? is there a discussion somewhere on how to qualify for a business card?... meaning how "businessy" does one need to be? Does anyone know if Canadians are eligable for the Citi AAdvatage Platinum Select MC? No real discussions but depending on the issuer, you don't have to be too businessy as many small businesses are run under a person's personal name, taxes etc. and their only tax identification is their SIN.